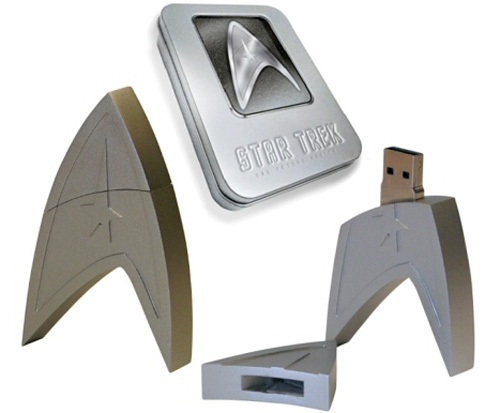 Get The New Star Trek Movie On A Limited Edition Flash Drive | OhGizmo! This is the perfect Christmas present. I'm a little torn on this, I love collecting DVDs and think having a USB version would mean burning a DVD to watch it on my TV… But it is pretty different, but can we say JLO did it? Even though you didn't talk about it, I'm offended that you imply a dislike for the new movie. Sooo much better than anything that's happened since TNG ended. Well in their defense the movie to a true fan was a bit off. Like we understand that the timeline was changed, but not so much that Spock's mother had different hair color. Or that Captian Pike was not the right age, the list could go on, I tried not to pay too much attention to details like that. One thing most complained about even with timeline interference, the technology shouldn't have been that advanced. But if you just watched it no strings attached, it was pretty awesome.